That afternoon or anytime walk; the best day for a dog, besides your arrival home. We love walking dogs and spending that time working with them and being with them. Your dog’s needs will be met and we will reinforce all training and keep the walk positive, productive and fun. I have been training dogs for over 20 years and I still find a dog walk to be one of the most fulfilling things I do with my dog and with yours. Our dog walkers are all personally trained by Steve Walter. They must possess three years handling experience and be animal CPR certified. 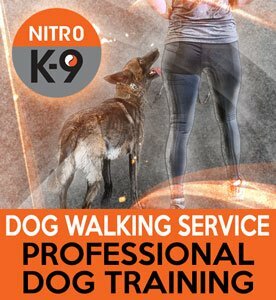 When your dog is walked by someone with years of behavior and medial experience you can rest easy knowing your dog is being walked by Nitro K-9. We love what we do! Training clients receive FREE training reinforcement on all walks. We serve 2, 3 or 5-dog homes! We urge you to be careful when selecting a dog walker. Many dog walkers have no qualifications at all; or they have only a great love for dogs, but lack the proper experience to guide your dog and be a truly positive influence in that dog’s life. Since we know dogs are always learning; we know they must be walked by a professional. Your dog will learn something new and have a great time. We are professional dog handlers and dog lovers. We know the importance of shaping behaviors and our impact on your dog’s life will be big. We take this trust very seriously, and we strive to bring the best out of your dog every day. Please ask us about rates for 2 or more dogs. We also offer monthly packages. We require a 5 day a week min for any dog walking under 1 hour. We offer 3 days a week for full hours only.